Billy Johnson, driving the No. 61 Roush Performance Mustang Boss 302R, led the final 18 laps to win Friday’s Continental Tire Sports Car Challenge Series BMW Performance 200. Johnson’s victory with teammate Jack Roush Jr. gave Roush’s father, team owner Jack Roush, his first GRAND-AM victory at Daytona International Speedway.The margin of victory over second-place Charles Espenlaub in the No. 48 Fall-Line Motorsports BMW M3 was 1.061 seconds. Espenlaub’s teammate Bryan Sellers was third in the No. 46 BMW. Twenty-five of the race’s 58 laps were run under a total of six caution flags. The race began on a wet surface, which dried as proceedings progressed. And in the end, things played in the Roush team’s favor. Johnson, who had taken the lead on lap 41, held the point through the race’s sixth caution on lap 53, and persevered over the final three laps. The next Continental Tire Sports Car Challenge race will be at Barber Motorsports Park in Birmingham, Alabama on March 30-31. You can see an interview with Jack Roush Jr. after the race in the video below. 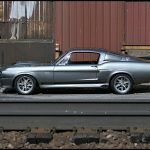 This entry was written by by MustangsDaily (Mustangs Daily) and posted here on Friday, January 27th, 2012 at 6:07 pm and is filed under billy johnson, boss 302r, ford mustang boss 302r, jack roush jr., Motorsports, mustang boss 302r, roush boss 302r, roush performance, roush performance boss 302r. This article was not written by us, rather gathered using RSS feeds listed here. We take no credit for this article. You can leave a response, or trackback from your own site.